Basie to Ellington and Beyond with Dan Mar-Molinero, May 25th / 26th 2019. We are pleased to welcome Dar Mar-Molinero to host a Basie to Ellington and Beyond Big Band Workshop in May 2019. Dan is a saxophonist, composer and educator and has been recognised nationally for his work in jazz and commercial music both as an educator and practitioner. Alongside composing and performing, he is a lecturer in Jazz & Popular Music at the University of Southampton, a tutor for the NYJC and runs the pioneering youth jazz organisation, SYJO. This 2 day Big Band workshop is for all ages (minimum Grade 3 standard playing ability). Vocalists, Saxophone, Trumpet, Trombone, Keyboard, Guitar, Bass, and Drums. 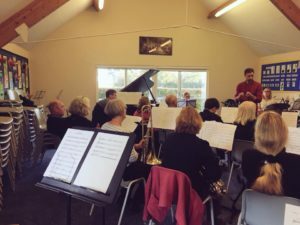 The course will concentrate on improving your reading, arrangement, improvisation and band leading skills, giving you the ability to go away understanding more about the inner workings of the Big Band. The cost for the two days including tea, coffee and cold refreshments is £120.